Virtual Reality (VR) has been around since the mid to late 1800s. However, the term was not actually coined until 1987 by Jason Lanier during a period of immense experimentation with VR equipment. VR has come a long way from stereoscopes and full-body VR sets to the Oculus Rift and Google Glass. Only the future knows what lies ahead in the midst of this unpredictable, but immensely democratic technology. That is why VR is so desperately needed in the Black community. 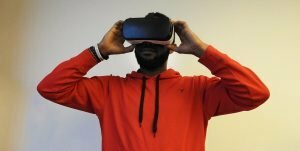 VR has the potential to be the one tool to help us safely converse about racism and prejudice, while also educating the public about what it’s like to be black, and finally, giving us space to not only talk about race issues, but to “experience” them head on. 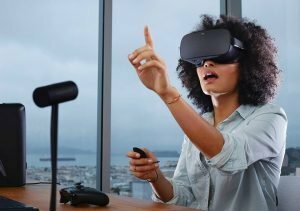 You may be asking how did I develop this unique perspective on VR? I was a graduate student in Digital Media at the Georgia Institute of Technology from 2014-2015. During that time, I experienced first hand just how profoundly AR/VR can impact low-income communities, giving them room to be topics of discussion, rather than ancient relics among modern industrialism. Often these “ancient relics” are comprised of people on welfare, with disabilities, and those with low-paying jobs. It is these people that are silenced and it is this technology that can give them voice and agency. There is also many times a rich, but often overlooked history in the midst of many of these dilapidated neighborhoods. At Georgia Tech, we were tasked with creating immersive experiences in the town of Old Fourth Ward, on the street of Auburn Avenue, near where Martin Luther King Jr. was born. It is home of the Atlanta Race Riot and the Atlanta Daily World. So many historical figures came out this town and era that the streets are covered with statues, museums, and graffiti, that all do nothing but illuminate this immense history. At first coming up with ideas for a truly immersive AR/VR experience was tricky. Many people in these neighborhoods do not have access to smartphones so it would be interesting to see how exactly this experiment would work. Some basic VR ideas included creating a panorama of many of the dilapidated buildings to show what they used to look like, give some backstory on their purpose, and show just how important it is to restore some of these buildings in order to revitalize a sense of community. In 1976, Auburn Avenue or “Sweet Auburn” was declared a national landmark. That means no businesses, or private enterprise can touch it. However, declaring a town a national landmark and actually doing something to spark community are two very different things, an urgent gap that only VR can fill. However, as more time passed, the teams started to get more serious about their ideas. 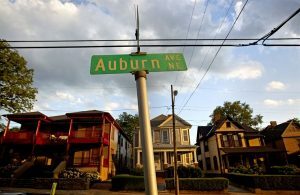 One team decided to create a virtual time capsule that included an interactive and detailed history about “Sweet Auburn” in different places around the town. This time capsule was a collaborative experience because it allowed visitors to add their own virtual mementos and time stamps. Our team on the other hand decided to come up with a VR game that would allow Sweet Auburn residents and newcomers alike to virtually participate in rallies and protests, to stage sit-ins, hear speeches conducted by local leaders, and much more. As each item on a virtual checklist was successfully completed, they would move on to more difficult tasks. Each task was meant to encapsulate what it meant to live in the early 20th century. This type of immersion is not only fun, but it is highly educative, and anyone can participate. There was also another segment of our group that wanted to focused specifically on the abundance of graffiti in the area. The graffiti on Sweet Auburn represents a “Living Walls” initiative that seeks to share real stories through art. It is a way that allows people to create conversations about what they dub “public space” and its implications. There are murals of John Lewis and many other historical figures. But for the most part, the murals are largely symbolic, making it hard to discern what they represent. The basis of the Living Walls segment was that ultimately, anyone with a smartphone could participate. All they had to do was to walk up to any piece of artwork, scan it with their phone, and get the latest information on the art, what it symbolized, and the name of the artist. As it stands, there is very little information about what any of the art actually means and even less about who created it. As you can see there is so much that can be done on Sweet Auburn and I am sure that many more neighborhoods could also benefit from the capabilities that VR provides. It takes the quote, “walking in another man’s shoes” to a whole new level. By giving us space to not only talk, but to experience issues surrounding blackness is one of the benefits that this technology provides. Using VR in this way is only one of the many first steps to liberating and revolutionizing not only the black community, but what can only be described as the black experience.